Derry moved forward to an Ulster Senior Hurling Championship semi-final meeting with Down next Sunday in Owenbeg after a less than convincing four point victory over Division 2B Donegal in Celtic Park. Tom McLean’s men looked to be suffering something of a hangover from their recent Christy Ring Cup final defeat to Kerry following this disjointed 70 minutes display in which they could not put Ray Durack’s determined team away. Credit though must also go to Donegal who never gave in despite falling seven points behind on two occasions in the second half. Every time Derry looked to have the game won, Donegal responded with a goal as Ronan McDermott helped himself to a hat-trick and Kevin Campbell finished with two. In a match Derry were expected to win with something to spare, they got off to the perfect start with Ruairi Convery scoring an early ‘65 and a point from play to put the Oak Leafers two up inside the opening two minutes. The lead was three after six minutes when Na Magha’s Alan Grant slotted over a nice point and at that stage there seemed little chance of an under-strength Donegal making any sort of game out of it. However, Derry’s first half lethargy was only fuelled by that early lead and with their first meaningful attack, Durack’s underdogs had levelled the game through a Kevin Campbell penalty after Sean McVeigh was fouled. If there was any doubt about the award, there was none about Campbell’s emphatic finish which brought Donegal to 1-0 to 0-3 with seven minutes on the clock. The goal also breathed belief into the visitors and while they never led, they clung determinedly to Derry and refused to allow McLean’s men to coast to an easy victory. Paddy Henry and Enda McDermott swapped points before Jonathan O’Dwyer and McVeigh did likewise to leave it 0-5 to 1-2 20 minutes in. Kevin Hinphey was finding himself in acres of space along Derry left side and the only real surprise was it took Derry until the 21st minute to spot him. Once they had he started to utilise the space and helped himself to a point which was followed by another henry free for a two point Derry lead. Donegal were still in the game though and Bernard Lafferty should have done better when he found himself 20m out from the Derry goal but, in two minds, his shot lacked conviction and a great scoring chance was wasted. Hinphey was still enjoying the freedom of the park and extended Derry’s lead on 24 minutes after brilliant work from Sean McCullagh but it was soon cancelled out by a Ronan McDermott effort. Michael Warnock scored a superb solo point for 0-9 to 1-4 and when Alan Grant did brilliantly along the left hand touchline and picked out Hinphey in space once again, The Kevin Lynch’s man sent a searing shot to the roof of the net for five point lead four minutes before the break. Further points from Aaron Kelly and Paddy Henry (free) seemed to signal Derry had finally moved up a gear but Donegal weren’t finished just yet. A monster free from Danny Cullen from well inside his own half caused mayhem in front of the Derry posts and when Derry were adjudged to have touched the ball on the ground a 20m free was awarded. Instead of the going for a point though, Campbell drilled a low shot under Derry keeper Barry Robinson to leave it 1-11 to 2-04 and keep the visitors well in the game at half-time. With 17 seconds of the restart Derry appeared to have reasserted their authority once again when a move that saw the ball go from O’Dwyer to McGuigan ended with Grant finding the net with a neat finish for 2-11 to 2-4. That should have been the signal for a comfortable half but even minus seven regular starters, Donegal refused to lie down and stayed in the game well until another long ball in toward the Derry goal from Enda McDermott picked out his brother, Ronan, who grabbed Donegal’s third goal to make it 2-13 to 3-5 in the home side’s favour. The scores kept coming in a match almost devoid of shape now but following a definite pattern. On 59 minutes, Derry substitute Brendan Douban again looked to have settled the issue when he netted after a nice solo run and shot but with 60 seconds Ronan McDermott had replied in like at the other end to leave it 3-13 to 4-06 with 10 to play. 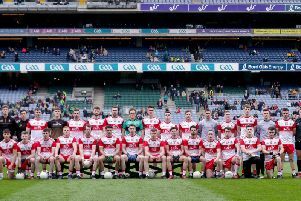 The disappointment for Donegal will be Campbell had a number of scorable frees to get them even closer to Derry who once again forged ahead to build a 3-17 to 4-7 lead before McDermott completed his hat-trick with a goal in injury time after good work from McVeigh. It was too little too late for a Donegal team who had probably surpassed their expectations, especially given their list of absentees. For Derry, it will take a marked improvement in attitude to see them into an Ulster Final against Antrim.